Now that it is official that Troy Polamalu has retired, it is pretty much a forgone conclusion that the Pittsburgh Steelers will draft a safety in the 2015 NFL Draft. It would make little to no sense to try to find a player that compares to Polamalu, and this draft for safeties is not considered to be an elite one, but there is always a gem in each draft. As of now third-year safety Shamarko Thomas is projected to start at strong safety. But the Steeler way is to bring in young competition to push the veterans. When it comes to good to great safety tandems in the NFL, both safeties compliment each other well. If one is a hard hitter, the other safety will be better in coverage and vice versa. When it comes to free safety Mike Mitchell he is a hard hitter but not elite in coverage (zero interceptions last season). That being said, it will be ideal for the Steelers to look for a safety that has shown above-average to superb coverage skills, and the ability to play both free and strong safety – plus special teams. 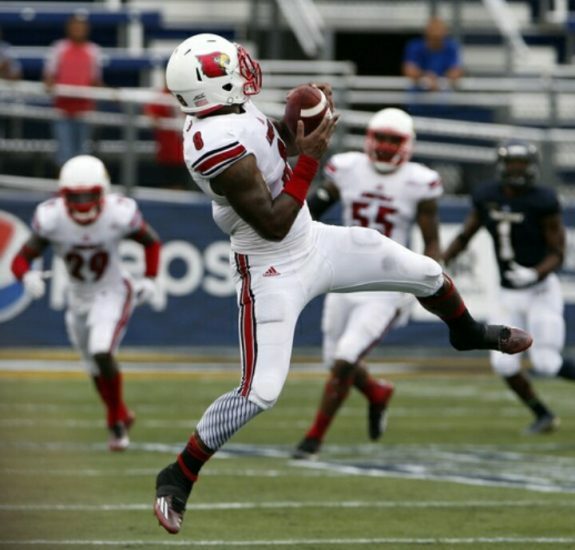 Prospect Gerod Holliman from the University of Lousville had 14 interceptions last season, displaying elite man-to-man skills on wide receivers. In Keith Bulter’s defense, the focus will be on pressure and creating turnovers. Holliman was effective in blitz schemes, and has the potential to play inside corner early on in his career if the secondary is hit with any injuries. Holliman is not a physical tackler, but will wrap up soundly when he doesn’t get sloppy in his technique. A potential gem in this draft is Kurtis Drummond out of Michigan State. Drummond who stands 6’1″, 208 pounds is rangy, has shown great ball skills, fluid movement in space, possesses great length, has a ton of experience covering slot recievers and tight ends in man-to-man, and excels in zone coverage. Drummond uses his hands well and can easily disengage from blockers – a special skill considering safeties are the last line of defense. Drummond instantly would boost the special teams with his intensity and intelligence while learning the defense, and Drummond comes from a winning program. Durell Eskridge from Syracuse stands at 6’3″, 198 pounds and can cover space extremely well. Eskridge has shown the ability to play both safety positions and was a reliable centerfielder, which will help greatly in deep pass defense. History has shown, for example in former players such as Chris Hope and Ryan Clark, that being able to play centerfield is vital for the Steelers defense. Eskridge can play in the box but his physicality needs to improve before the Steelers can use him more there. Some extra time in the weight room and learning the Steeler way should solve that problem. Eldridge’s ability to anticipate throwing lanes should make him a candidate for multiple interceptions in his rookie season. Something the Steelers got zero from last season was interceptions from the safety position. The Steelers have proven to be smart drafters over the years and six Super Bowl rings prove that. They know that the safety drafted in 2015 must have above average coverage skills to help out mostly undersized cornerbacks. Be the first to comment on "Scouting Potential Gems At Safety"